Looking for fast and delicious coffee creamer recipes? Then you’ve come to the right place. 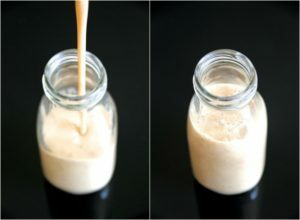 It couldn’t be easier to make your own delicious coffee creamer right in your own kitchen! All these recipes are super easy (some have only three ingredients!) and can be made in almost no time at all. 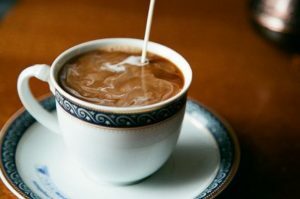 Sometimes you need something to shake up the taste of simple black coffee, and coffee creamer is a wonderful thing that can replace milk and sugar in your coffee routine. Creamer gives your coffee a smooth, creamy texture and adds delicious flavor, so you can start your day right. 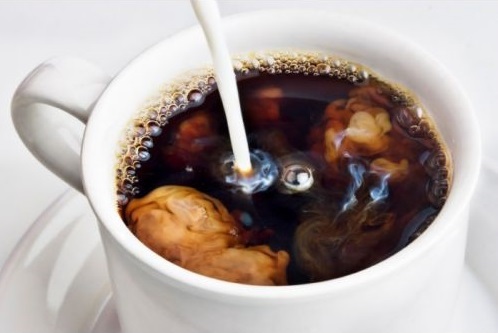 Real coffee aficionados are probably cringing at store bought creamers that overload their fine roast with artificial sweetness, and homemade creamer is the perfect solution. Store bought coffee creamer can’t come close to what you can make at home. You can use all whole food ingredients so you know exactly what you’re putting in your coffee and you can control how sweet and strong the flavor is. Even if you have a Keurig, you can consider using one of our flavored creamers as flavoring for plain coffee, instead of buying the more expensive flavored K-cups! If you are looking for other coffee flavors, plus a surprising weight loss trick, take a look at our article about Butter in Coffee and the surprising – delicious – benefits it has! This is the classic, creamy French Vanilla creamer that will turn your coffee into liquid gold! An absolute staple in any coffee lover’s household, making your own French Vanilla Creamer saves you money, and lets you add the exact amount of sweetness that is right for you. You can just pour these ingredients into a jar, put on a lid, and shake! If you use Honey or Agave Nectar, you will probably need to blend it to make sure they are fully dissolved. Put it in the refrigerator to chill, and your creamer will last up to ten days! If you’re worried about added calories, try this lighter version of the French Vanilla creamer recipe. The Low Fat Condensed Milk gives the silky texture we all love, without the guilt of extra calories. Replacing the cream with condensed milk does your waistline a favor, without losing our favorite flavor! Just blend or stir these ingredients together and enjoy! Make sure that you stir the mixture really well, because the Condensed Milk will settle to the bottom. Kept in the fridge, this creamer lasts approximately two weeks. If you’re looking for a great tasting non-dairy creamer, this one’s for you. 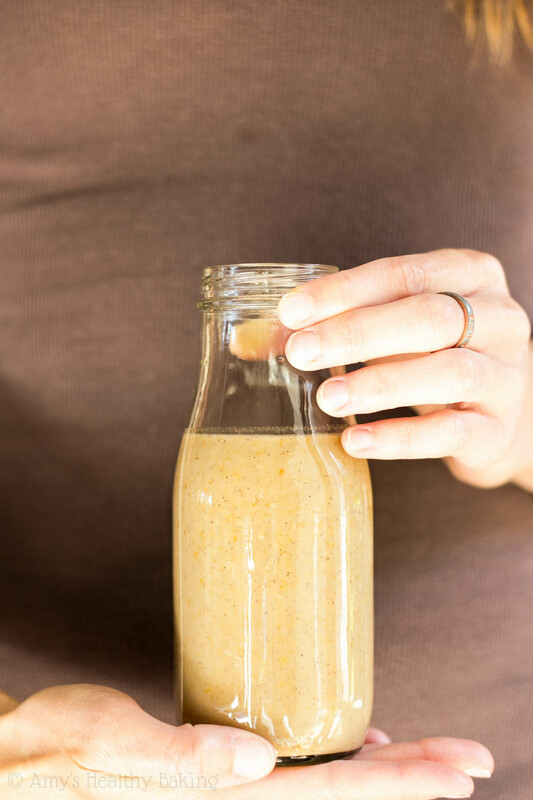 This is an alternative to making Almond Milk Creamer (recipe below). Almond Milk Creamer is fantastic, but it does take some time, and in today’s world, sometimes time is very limited. This recipe can be done in less than five minutes. The Coconut adds a slightly different flavor that’s refreshing and unique, definitely a creamer a coffee-lover should try. Just blend the ingredients for 30 seconds and add your creamer to your coffee! This is another recipe that you can just put in a jar and shake up, making it super easy to make on the go. Keep the mixture refrigerated in a sealed container, and your creamer will last up to a week. You can add some extra ingredients to any of the three previous creamers listed to give your coffee a little flair. You can make a coffee drink just as good as one bought in a coffee shop – but at half the price! When the cool season comes – or when you are missing the Autumn leaves – you start craving the spices and warmth of Fall. This creamer turns your coffee into the ultimate Fall comfort food. Made with real Pumpkin instead of flavoring, this creamer makes a better, more wholesome treat than the Pumpkin Spice Latte you buy from the coffee shop, and it is way less expensive. Whisk the Heavy Cream (or substitute), Pumpkin Puree, Maple Syrup, and Pumpkin Pie Spice together over medium heat. Add the Cinnamon Sticks and bring the mixture to a boil, stirring occasionally. Only let the mixture boil for a minute, then remove it from heat and allow it to cool. Store your creamer in the fridge, and shake well before using. For a little extra pizzazz, try serving the coffee and creamer with whipped cream! ** If you want a fresher flavor. You can make your own Pumpkin Pie Spice by combining 1½ Teaspoons Ground Allspice, 1 ½ Teaspoons Ground Cloves, 2 Teaspoons Ground Ginger, and 3 Tablespoons Ground Cinnamon. You can change the measurements to taste if you like a more concentrated flavor of a particular spice, or if you want to reduce the intensity of something. Another delicious non-dairy option is Almond milk creamer. This coffee creamer recipe is also a healthier alternative to half-and-half, that saves you on the calories, and still gives you a rich, satisfying flavor. This creamer can be just as thick and creamy as the ones with more calories, so it is definitely worth the time. This recipe takes longer to make, and takes a bit more work, but the results are absolutely fantastic! We promise you it will be worth the time and effort. First place the Almonds in a jar and add 2 Cups of Water. Seal the jar and let the Almonds soak. The longer you soak the almonds, the creamier your creamer will be, so you want to soak it for up to 48 hours. But be careful not to soak them longer than 48 hours! They will spoil and it is quite a nasty mess to clean up. If you let the Almonds soak for 48 hours (as we recommend) the water will need to be changed after twelve hours. Once the Almonds have soaked, drain the jar and rinse the Almonds. Put the Almonds and 1 ½ Cup of Water into a food processor or blender. Puree the blend until the Almonds have been pulverized and the mixture is white. 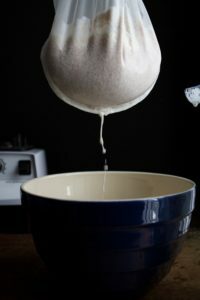 Put a nut milk bag in a bowl, then pour the pureed almond blend into the bag. Lift the bag and squeeze to get all the milk out of the almonds. If you don’t have a nut bag, you can use a cheese cloth. If you do not have either of those, coffee filters will work really well too! All of these coffee creamer recipes have delicious results, and each one has their own benefit. The full calorie creamers are absolutely wonderful, but you can have a light version without sacrificing the flavor. The non-dairy creamers are flavorful and thick, so you are not sacrificing the creamy goodness of dairy if you choose to make our Vegan Coconut Creamer, or the Almond Milk Creamer. There’s also something satisfying in making your own creamer, knowing that you can do a better job than almost any product in the grocery store. 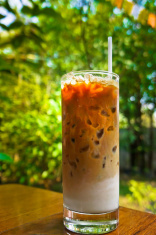 You can make a delicious Summer treat by adding these creamers to iced coffee! If you want to make an easy and fabulous Frappuccino, just make your creamer, going a little heavy on the spice. Then blend it with coffee and ice and you’ll have a frozen treat worthy of any Coffee Shop! 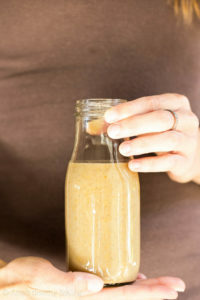 You can also check out this great Homemade Frappuccino Recipe from Pioneer Woman.com. These recipes are are treat for you and your household, and they can even make a unique hostess gift when you’re visiting veteran coffee drinkers. Both you and your host will be amazed with the difference between homemade and store bought creamer. Even the coffee snobs who look down on creamer, may be convinced to change their ways!